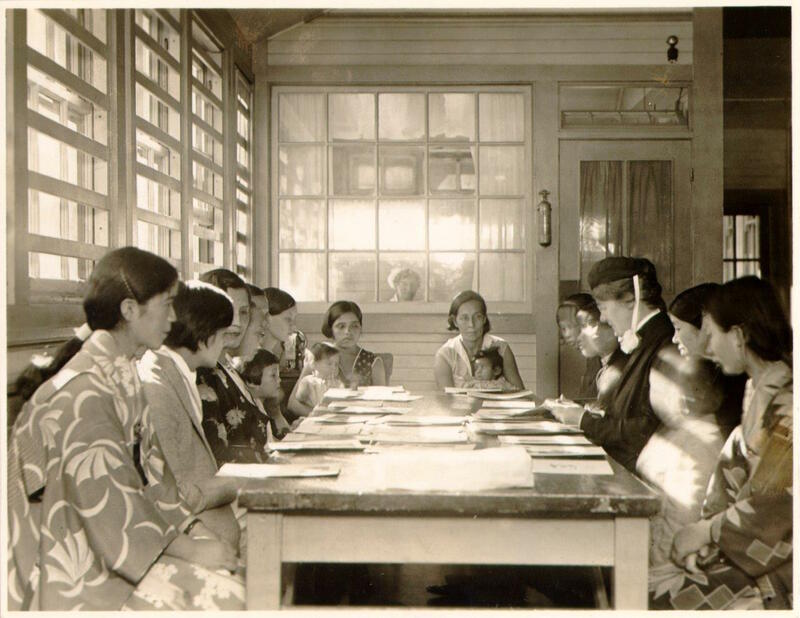 In this photograph, Deaconess Katherine Mauer conducts a language class for women. Mauer, called the “Angel of Angel Island,” was a member of the Women’s Missionary Society of the Pacific Coast. The organization helped immigrant women, particularly those rescued from Chinatown’s slave trade, learn English and other necessary skills. Mauer served Angel Island detainees and the immigrant community in San Francisco from 1912 until 1951. Other religious and volunteer organizations also visited Angel Island regularly, which provided detainees with educational and recreational activities while they waited. “Deaconess Katherine Maurer and a group of immigrants on Angel Island,” Digital Public Library of America, https://dp.la/item/5d672b01310e0f6daebf6836fec77fd6.